Boxing's No. 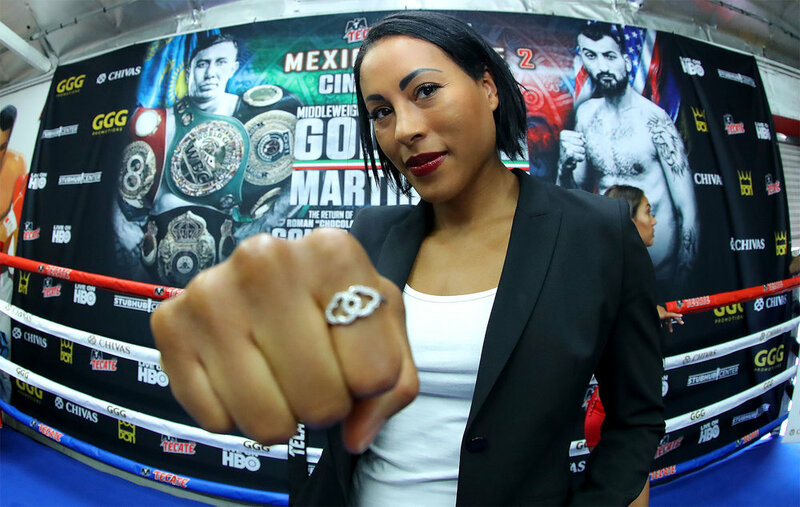 1 pound for pound fighter, Cecilia Braekhus, will defend her World Female Welterweight crown against former WBC Female World Middleweight Champion Kali Reis in the co-feature of the Gennady "GGG" Golovkin vs. Vanes "The Nightmare" Martirosyan World Middleweight Championship event. Both world title bouts will be televised live from StubHub Center on HBO World Championship Boxing, beginning at 11 PM ET/PT. This marks the first time a women's bout has been televised live on HBO. Braekhus (32-0, 9 KOs), a native of Cartagena, Colombia, who fights out of Bergen, Norway, is now trained by former world champion Lucia Rijker. Braekhus will be looking to extend her nine-year world championship reign with her 22nd consecutive title defense, against Reis (13-6-1, 4 KOs), from Providence, RI, in a 10-round championship bout between two of the most dominant women fighters. "I'm honored to fight on the same card as the best male fighter in the world, Gennady 'GGG' Golovkin, at the StubHub Center on May 5," said Braekhus. "I've heard so many magnificent things about fighting in Southern California and the passion boxing fans have for great fights. Cinco De Mayo at the StubHub Center will truly be a special night for the boxers and the fans. I've been training in Los Angeles for the last six weeks with Lucia Rikjer, and this has been a tremendous camp particularly since I am able to work in the beautiful weather out here. I've not fought in America in ten years and this is truly one of the high points in my career and I want to thank my fans all over the world for continuing to push me to great heights. I know how tough Kali Reis is, and I'm ensuring every step in camp will prepare me for victory." "It's been great working with Cecilia, she is so talented, and even more, so very dedicated to working hard and continuing to learn every day," said Rijker. "We can't wait to show boxing fans at the StubHub Center and those watching all over the world what we've been working on." "I am very excited for this opportunity. I'd like to thank Cecilia and her team for this once in a lifetime chance to fight the No. 1 pound for pound undisputed champion," said Reis. "My team and I have been hard at work knowing she will bring her A game, so will we. This is such a great card and I am grateful to be a part of it." Reis, 31, will be making her 2018 and West Coast debut when she challenges Braekhus. After winning IBA and UBF titles, Reis, traveled to New Zealand in 2016 and won a split decision over Maricela Cornejo to capture the vacant WBC World Female Middleweight Title. It was the first time New Zealand had ever hosted a major world championship fight. Reis enters this fight having won six of her last seven fights, the only blemish, a decision title unification loss to undefeated WBO World Female Middleweight Champion Christina Hammer. Reis is promoted by Joe DeGuardia's Star Boxing.